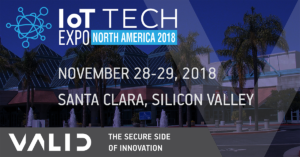 Valid is a sponsor of the upcoming IoT Tech Expo event taking place on November 28-29 in Santa Clara, California. Our Mobile Solutions and Software & Services teams from across the globe will be in attendance to demonstrate the latest innovations in our IoT solutions, including a demonstration of some of our capabilities. We will also have one of our subject matter experts, Mikael Dubreucq, in attendance and speaking at the event. The world’s largest IoT event series will bring together key industries from across the globe for 2 days of top level content and discussion. Exploring the latest innovations within the Internet of Things and covering the impact it has on many industries including manufacturing, transport, supply chain, insurance, logistics, government, energy and automotive. Key topics examined include: smart building & facilities management, building the connected supply chain, intelligent city and transport management, smart grid data management and analytics, asset monitoring and management, delivering smart connected new products, and much more.